I arrived in The Music Hall of Williamsburg a little after 8PM, I thought I was late but I figured out I was early. Inside the hall, the stage had been setup with rope lighting for Still Life Still's set. Across the front part of the stage, there were pink and blue rope lights. Further back were white rope lights which seemed to be the demarcation line between Still Life Still's performance spot and Wild Beasts equipment. Still Life Still walked on stage at 9PM but then walked off only to walk back on stage five minutes later. After a grinding attention grabbing song intro, the band went into there first song which had some nice guitar work and a driving backbeat. Still Life Still did a full set of approximately 10 songs. To this listener, Still Life Still seemed like a garage band. Their songs felt more like structured jams as opposed to being structured songs. Still Life Still's vocals were often shared among 3 band members singing in unison. Their vocals had a willowy lightness to them that was audible behind the music instead of in front of it. Still Life Still is Eric Young and Brendon Saarinen on guitars and vocals, Derek Paulin on bass, Aaron Romaniuk on drums and with Josh Romaniuk.on keyboard and percussion. Violens were a great surprize. I had expected Wild Beasts to be up next because Violens weren't originally listed on the bill. The four came on stage a little after 9PM. They performed 8 songs. Their songs were melodic and seemed well written. Violens harmonies reminded me of bands from the mid-sixties like the Zombies, Hollies, Peter & Gordon and Searchers. The Violens harmonies were lush, which may have been due to the amount of reverb making them sound like 60's live analog recordings. Though there were times, during the their set on Sunday night, when there was a little too much reverb and the vocals started to sound like mush. But the sound the Violens were trying to achieve mostly came through and I think everyone in the room got it. I was unfamiliar with the Violens music but the one song that did stick in my head was "Already Over," which was the first song of Violens set. Violens are listed on many websites as being Iddo Arad on synth and vocals, Ben Brantley on bass, Jorge Elbrecht on lead vocals and guitar, and Kris King on drums. On Sunday, Elbrecht was playing acoustic for the entire set. And unless my eyes were deceiving me, Brantley was playing electric guitar and at times used a pedal to have his guitar play bass notes. As I watched Wild Beasts, on Thursday night, I couldn't help but think that they gave themselves the perfect name. 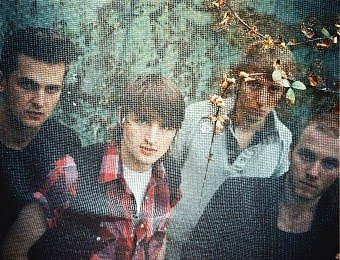 I may have partially come to that conclusion because Wild Beasts' brand of pop music seems untamed, i.e., unconventional and therefore doesn't fit neatly into any specific category. What struck me most was that Wild Beasts contained 4 members with 4 very seperate personalities, which coalesced into one very distinctive unit. I'm going to break it down, so you can see what I mean. Vocalist and instrumentalist Hayden Thorpe has a falsetto voice that sounds like a choir boy from the renaissance. Tom Fleming, who is also a vocalist and instrumentalist, has the same kind of vocal phrasing and sound as Paul Weller from The Jam (later Style Council). Guitarist Ben Little plays hyponotic rythmic leads like The Edge from U2, and drummer Chris Talbot has a big sound, akin to a symphony's timpani player or are marching bands drummer. At 11:05, the house went dark and a recording of a sequenced synth patch with a women's voice played as Wild Beasts walked on stage. (It would have been nice if the voice over were a little more decipherable - but hey - I'm not the sound guy.) Wild Beasts started with the intro to "The Fun Powder Plot." Once Ben Little's guitar part began the audience showed they recognized the song by cheering and screaming. It seemed like Hayden Thrope had trouble going back and forth between the high and low register of his voice as he does on the recording. The band should probably do the song later in the set, once Thrope's voice is warmed up. It was the only time I noticed any vocal trouble. It truthfully, did not kill the delivery of the song but it was noticeable. The band went immediatly into "We Still Got The Taste Dancing On Our Tongues." Again the audience cheered as soon as they heard Thrope sing the opening vowels. Chris Tablot played an even four and utilized the set of bongos that were part of his drum kit. As I was watching Ben Little dance around stage with his guitar, it was the first time I noticed that he wasn't wearing shoes. Later on, I noticed that Tom Fleming was in just his socks as well. However, I could have sworn that, Fleming had a pair of white sneakers on when the show started. "Vigil for Fuddy Duddy" was a song that I didn't recognise because I hadn't listened to Wild Beasts first CD "Limbo, Panto" as much as the second CD "Two Dancers." I wrote down the song's heavy beat that Chris Talbot was playing on the toms - Bum ba-bum. bum, bum, ba-bum. I hoped I could figure out the songs title, once I got home. The audience didn't seem to know the song as much either because they stopped cheering. "Fuddy Duddy" is a cool song, which on Sunday night, had great harmonies toward the end of it. I guess it's one of those songs I tend to ignore until I have my "Duh!" moment. A highlight of the Sunday evening's set was "This Is Our Lot." Hayden Thrope started the song with a bass line groove after the bass had been handed over from Tom Fleming, . The crowd was loving the song and once again got really loud. They sang along on the words "My Darlin, My Dumplin." I laughed because I thought I was the only corny person who sang along with that part. All through Wild Beasts set, Fleming and Thrope exchanged instruments. So each sometimes played electric guitar, bass or keyboards. On the song "Two Dancers-i," Thrope played keys and did background vocals as Fleming played bass and sang lead. The fun part came on the break when Fleming slapped his bass with a drum stick. Wild Beasts followed up "Two Dancers-i" with " His Grinning Skull." "Skull's" 6/8 meter was a nice change of pace and good seque back into "Two Dancer-ii. Tom Fleming thanked the audience before the band went into "Please Sir." He told Sunday night's audience that it was their last night of the tour in America. He said it had been an interesting tour, and that Wild Beasts had been shocked, humilated and cheered on. I think some guy must of thought it was his cue to get on stage 5 minutes after Fleming spoke. During the song "Brace Bulging Buoyant Clairvoyants," a guy in a porkpie hat jumped out of the audience and danced center stage . The guy danced, while lip-syncing, right beside Hayden who tried to make like he wasn't there. A bouncer eventually walked on stage an escorted the guy off. It was one of those funny moments that can only happen during live performance. After ending their set with "Hooting & Howling," the crowd really made it clear that they wanted an encore. There was a lot screams, claps and cheers (notice I avoided the hooting and howling pun). Wild Beasts returned with a 3 song encore which included my new favorite song "The Devil's Crayon." For the following song, "Empty Nest," Talbot exchanged his drum sticks for marching band bass drum mallets to create a giant sound. Wild Beasts ended appropriately with "Cheerio Chaps Cheerio Goodbye." It was really evident that the New York audience really loved and enjoyed Wild Beasts. I think they are a unique band that will continue to grow musically. Tom Fleming made it sound as if Wild Beasts got a mixed reception in the States. If that's true, I'm glad they were received warmly by New York City. They deserve it.